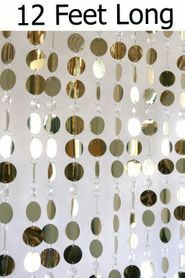 Metallic Gold Discs & Acrylic Crystals Beaded Curtain 3 Feet Wide x 6 Feet Long - New for this year: Now with a GOLD top rod! 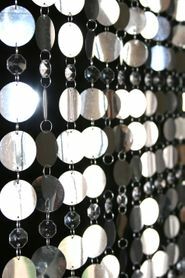 Our beautiful "Kate" beaded curtain is made out of awesome metallic PVC circles AND octagon shaped beautiful acrylic beads! The color of this curtain is LIGHT GOLD, which is a fantastic classy color! Each bead is attached to the next using jump rings, which makes this curtain very easy to make longer if you wish. You'd just purchase additional curtains and add the strands using the jump rings. Easy as pie! The Metallic PVC Circles are 1.5" in diameter and the Crystal Clear Octagons are .75 in diameter. There are 12 strands on each curtain. This curtain is perfectly lightweight, making it a great item to hang for your special events too! It will shimmer and shake with a little bit of breeze, which makes the room really come alive! The rod is 34" wide and the length of each strand is 6". So if you need to cover a space that's 47" wide, you would use two of this curtain. Just cut the second curtain down and hang it next to the first curtain. This will look like you've got just one perfect curtain hanging up! I purchased to use as part of a photo backdrop at a graduation party. I hung in front of a sheer curtain panel. Quick and super easy. They arrived quickly and in perfect condition ready to hang. Merchant Response:How fun!!! Thank you so much for taking the time to share your comments and your photo. 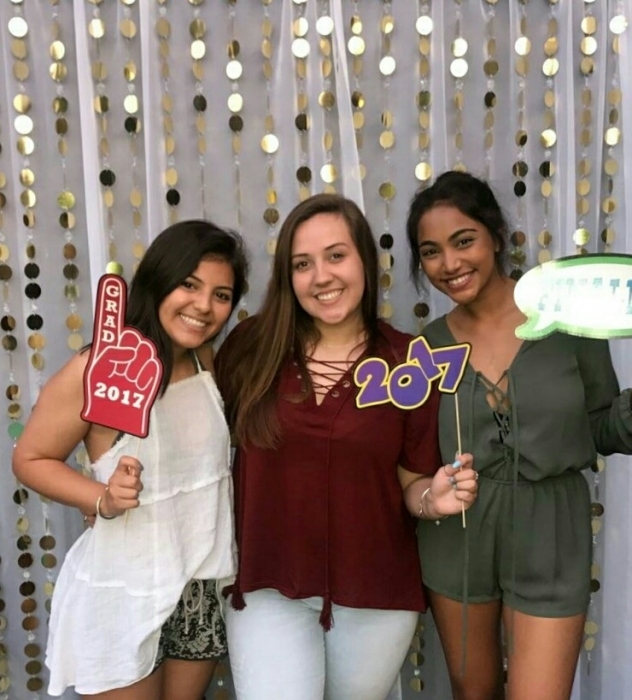 Looks like the grads really enjoyed themselves! ProsReady to go straight out of the box. Beautiful and we'll constructed. A quality item. Good price. All as promised. Video to come! All the headings and hooks where all in place just like the photo. Will buy this vendor again for future items! A1 Product and Customer Service! Always a pleasure to deal with! Beautiful products, fast shipping, great prices! ProsFAST FAST shipping to Canada! We ordered 5 of these to have as a backdrop for a work event. They were so pretty and shipped well. We received many compliments! Perfect for my glam guest room! I was looking for a bead curtain to glam up my guest room. The "Kate" curtain is perfect! It is very well made, and it hangs beautifully. This curtain is definitely a great value for the price. Prosit's modern and unique design. Consi wished it could have more rows with circles .